Home » Blog » Flossing the cogs, limit screws, and drive trains, oh my! Flossing the cogs, limit screws, and drive trains, oh my! Before joining the Community Cycling Center, my bike maintenance skills were limited. I knew the importance of keeping my tires full of air, my chain clean and lubed, and I could do some minor brake adjustments, but for the most part, the functionality of my bicycle remained a magical mystery. Over the last 2 years, my knowledge gradually improved. 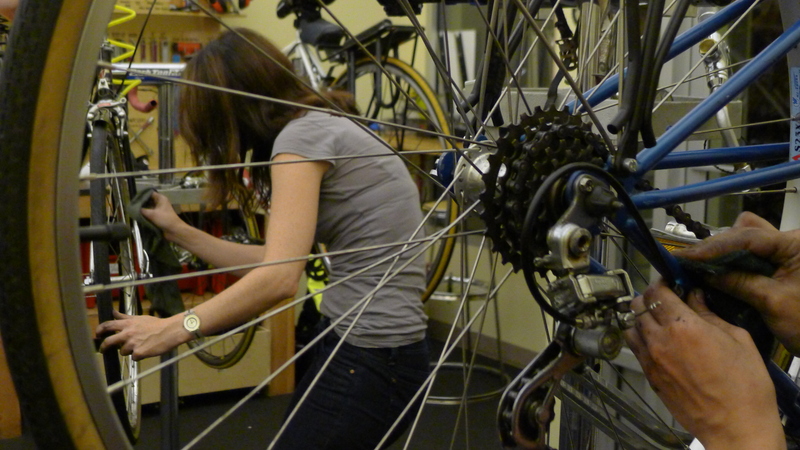 I learned how to fix a flat tire by volunteering at a Create a Commuter workshop. Patrick taught us how to clean rims and brake pads via his amazing Shop Tips. A Bike Club instructor demonstrated the importance of pre-ride bike safety checks, and a mechanic showed me how to put a new chain on my bicycle. This weekend, over the course of 5 hours, my bike maintenance knowledge increased exponentially by participating in part two of our Basic Bike Maintenance class. Five hours may seem like a long time for one day, but the class flew by quickly, due to the hands-on nature of the course. Jim, our instructor, demonstrated a skill, then we returned to our own bikes to practice, under the skilled guidance of Sherman, a friendly and knowledgeable volunteer mechanic (side note: Sherman used to own Coventry Cycle on Hawthorne). I learned so much in such a short time frame, including cool tips on how to properly clean my drive train; the importance of lubing derailleurs, brakes, and chains; and how to set up and align derailleurs through limit screws and barrel adjustors. Before this class, I found derailleurs to be an intimidating conglomeration of moving parts. During the class, Jim and Sherman demystified derailleurs and by the end, I successfully adjusted my rear derailleur and fixed the issue I was having with my lowest gear. 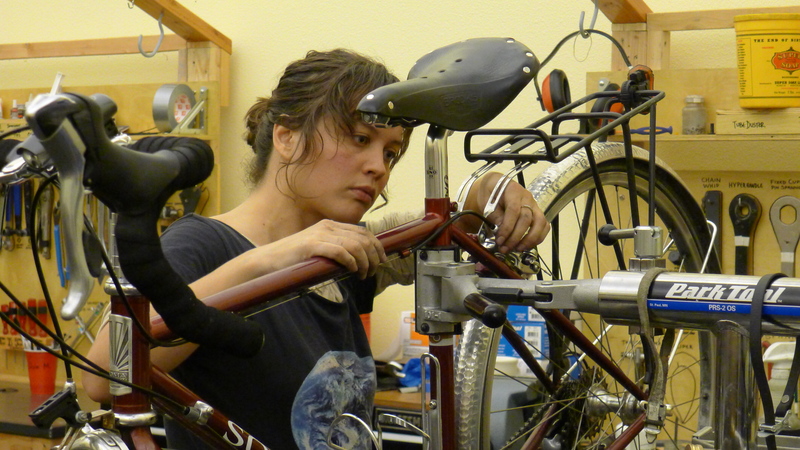 If you are interested in taking a bike maintenance class, check out our class page for more details. There are a couple of different options: you can take the 10-hour course over a series of 5 workshops in 2-hour increments, or 2 workshops in 5-hour increments. We’ll add more classes to the page in the future, so check back again later this year.